February | 2017 | Go, Leader, Grow! Today, my leadership team, my CEO, and I had lunch with Brenda Gerber today. Brenda is the VP of Development at Lifeline Youth & Family Services in Fort Wayne, Indiana. This was our 3rd “field-trip” that my my leadership team and I have been on in the past several months. Brenda has a fascinating background. She has been a professional fundraiser, has started an organization that helps the mentally ill in our community, and has served our former governor (now Vice President of the United States) and his wife in various roles. Brenda is a mentor and public speaker. She is a devoted wife and mother. Today at lunch, Brenda poured her heart into my leadership team. She encouraged and challenged them to intentionally grow and develop. She called on them to get uncomfortable in order to become the leader they were intended to become. These field-trips are designed to get outside of our office walls to learn how rich our community is and to meet the leaders that make it great. Brenda is one of those leaders. I am grateful for her investment in us today. I just learned of this last week when I heard Mel on a Success Talks podcast (via Stitcher). Since then, I’ve shared this with many. Click on Mel’s link to learn more. Buy her books. Watch her TEDtalks video. If you are looking for an inspiring book to read, I recommend Andy Andrew’s book, The Traveler’s Gift. It is full of meaningful insights, and it will make you think. What hurdles or obstacles are you facing right now as a leader? Your team is not meeting its goals? Your team is slow to change? A team member needs more counseling than coaching? You face a difficult project and the deadlines are looming near? The culture around you is lack-luster and you wonder if you can influence it? Below are some of my highlights from a chapter in The Traveler’s Gift. I trust this inspires and motivates you if that is what you need today. A person who is depressed is spending too much time thinking about the way things are now and not enough time thinking about how he wants things to be. Those who quit lacked faith. I know the outcome I desire. I hold fast to my dreams. It is only important that I continue the process with my eyes on the outcome. I just had a weekend of ups and downs. Life. Typical life. My daughter’s dance trio earned a spot to compete at the State Championship. I drove over 5 hours round trip to watch her 3 minute dance, and it was worth it. My son’s robotics team missed going to State by just 4 points. It was their best effort yet. Go RoboHawks! My wife was (is) ill. Maybe moving towards bronchitis. I feel for her. I hope she doesn’t infect me. I cleaned the garage and both of our vehicles. I hope they will remain clean for a least a week. I’m not holding my breath. Yes, all that is life. I’m not complaining. It is what it is. But this morning, I needed a mental refocusing. And I found it. I was on the app, Stitcher, this morning and began listening to Success Talks. It was an interview with Mel Robbins. 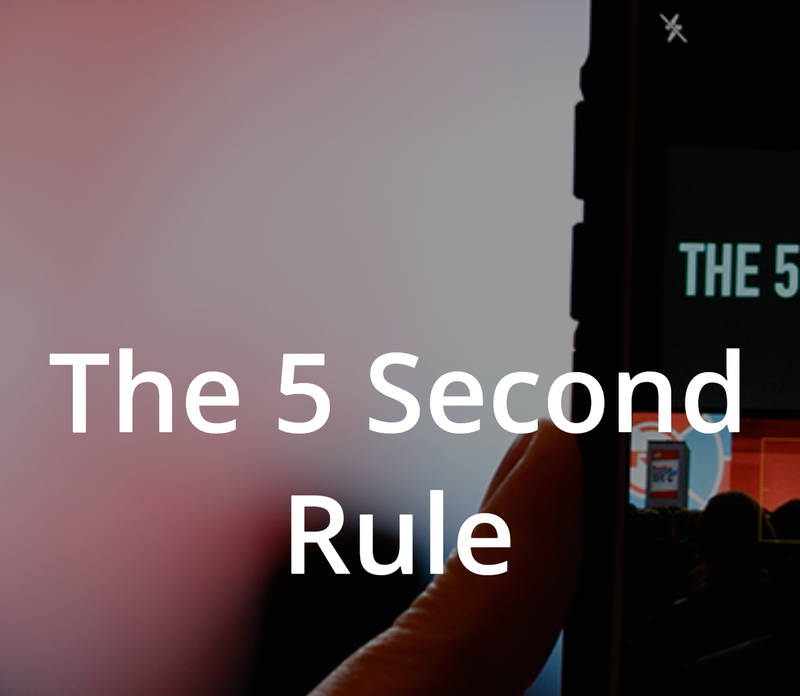 She was talking about her “5 Second Rule” – no, not that kind of rule. I won’t tell you what is it about. Excerpt from John C. Maxwell’s article “What Crisis?” in Success, March 2017.